Then imagine that the same bank has already received a government bailout once this year. And, further, that the reason for the bailout was through a government settlement which was not directly related to this specific bank. That is not all. Then envision that the first bailout wasn’t good enough. Things got so bad that this bank had to get congress to pass an act to make certain that the bank is solvent as well. Does this sound like a healthy financial institution? Does this sound like a good way to run a bank? Now, look again, and see that the same bank arrives at such dire straits with their capital reserves that they are on the verge of asking the Treasury for a bailout. Wouldn’t you assume that recent history would cause the bank to change it’s core lending standards? We will charge more to write a loan, we will go from 1.25% mortgage insurance premiums to 1.35%. Also, we will add some more long term charges to keep the money flowing in. However, our core lending standards requirement will stay the same. So, please give us the cash so we can continue our “sound lending standards” business model. I’m not sure if the American public, Congress or anyone of sound mind, would believe a bank could be so bold and reckless, after all we have been through the last four years. And, yet, this has all just happened. Also, once private lenders evaporated, high risk home buyers ( especially those would need a Down Payment Assistant program) were going straight to FHA. Now for their part FHA which insures these loans stopped the horrific down payment assistance program and forced Americans to have some skin in the game. I have long attested that FHA should have raised their down payment level years ago to stop the massive inflows of loans and have some more equity with the loans they insured. Why haven’t they? I believe it’s because the U.S government knows without a low 3.5% down payment option the chances for a housing market recovery are dim. So, the US government looks the other away with the low down payment options and an awful balance sheet when it’s their own agency, though we’ve heard the complaints about the careless lending standards on the part of private banks that caused so much trouble. Yes, those private lenders created much worse loans than FHA. For their part, FHA does verify income and requires a lot of paperwork. In reality the U.S. housing market can’t survive unless it has over leveraged balance sheet financial institutions to back up the loans, especially ones with a low down payment option. This isn’t going away anything soon with the low rate environment we are in. You know that if this was a commercial bank that required this type of a bailout, we would have heard an uproar, had congressional testimony and the Czar of the HUD would have been asked to step down. However, that clearly is not the case here. The double standard at FHA to me is hypocritical. 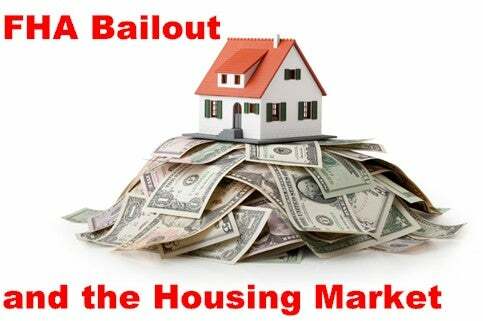 Once the next job loss recession happens FHA will have massive losses because of their low down payment option. FHA is still going to be making low down payment, low fico score and very generous underwriting standards loans for the future. They believe that they can’t even ask Americans to put 5% down instead of 3.5%. My belief is that we should raise the down payment to 7.5% and only allow the better qualified home buyers the 5% down payment option. This will prevent future calamity on FHA’s balance sheet. However, the odds of that happening are zero. This is outrageous. If we don’t ask Americans who want to buy a home, to put at least 7.5%-5% of their own savings down along with their mortgage, then we are not asking enough economic discipline of our people. Posted in Uncategorized and tagged FHA Bailout, FHA down-payment, FHA Lending. Bookmark the permalink. I was shocked to find out the mtg ins. premium rates recently. Not for this guy…. thank you very much.